I think a bit of context needs to be given to the ABC’s report, ‘Indonesian President vows to outgun Australia‘. Published the same day our new Defence White Paper (PDF) was released, the story’s headline made Indonesia look particularly hawkish. I’d like to offer my thoughts to clear up what Indonesia’s military modernisation is and isn’t about. The Unitary State of the Republic of Indonesia is non-negotiable. Our military forces must be larger and more modern than neighbouring countries, like Singapore, Malaysia, Australia, and so on. Given our vast country, the Indonesian military forces must absolutely be larger. This isn’t about Australia. Not only did SBY not single out Australia, his statements were about reassurance, not threat. What he said makes more sense when you consider SBY, a former general, was speaking at Latihan Gabungan 2013 (a joint military exercise involving 16,000 troops) in front of a large military crowd and, in the lead up to the 2014 presidential election, he was reaching out to a domestic audience. 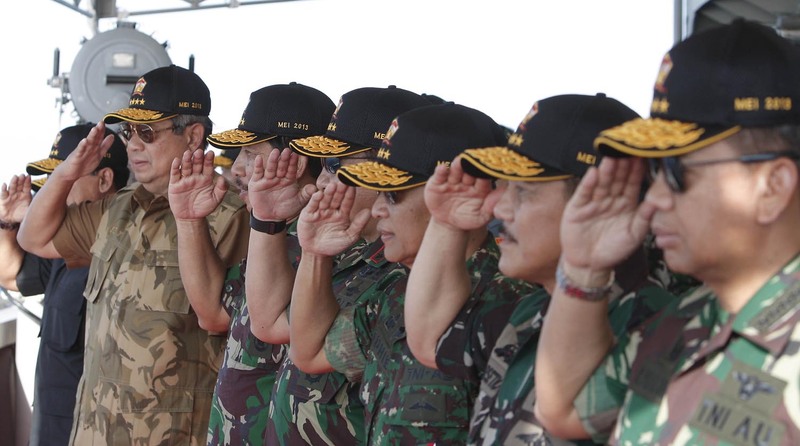 Looking at its strategic circumstances, it also makes sense for Indonesia to have a bigger military. It’s a vast archipelago with different strategic priorities, the most pressing of which are sovereignty and territorial integrity, and it’s in dire need to boost air and naval capabilities. Paragraphs 3.16 and 3.17 of the new Defence White Paper indicate that a cohesive and stable Indonesia is vital to our security. For one, we don’t want hostile actors to project power against us from Southeast Asia therefore, as Indonesia grows stronger and more capable militarily, there will be security dividends for the region. In any case, Indonesia’s military modernisation still has a long way to go as it progresses from a lower capability level and is building up indigenous technological expertise required for high-end capabilities. Furthermore, the history of military involvement in politics still has implications today for the levels of professionalism and conduct within the forces. Indonesia’s military has reformed to an extent, but there’s still the question of transforming into an effective defence organisation (PDF). The bottom line is Indonesia is busy sorting out its own house. These kinds of statements might be an editorial whim, but they belong to a broader context. So before we get anxious about who’s got the bigger military, let’s remember that it’s not always about us. This entry was posted in Australia, Indonesia, TNI by Natalie Sambhi. Bookmark the permalink. Nothing like a good headline to scare people, there were more than a few bits of context left out of the White Paper by the press. I actually wonder how much of that was directed at China. For home consumption of course. I have always thought that the TNI is for internal security and it is the basis of holding Indonesia together since its independence. I guess the headline can be very misleading. Thanks for the explanation!